If you’re embarking on your first backpacking journey, you will probably have a thousand questions. 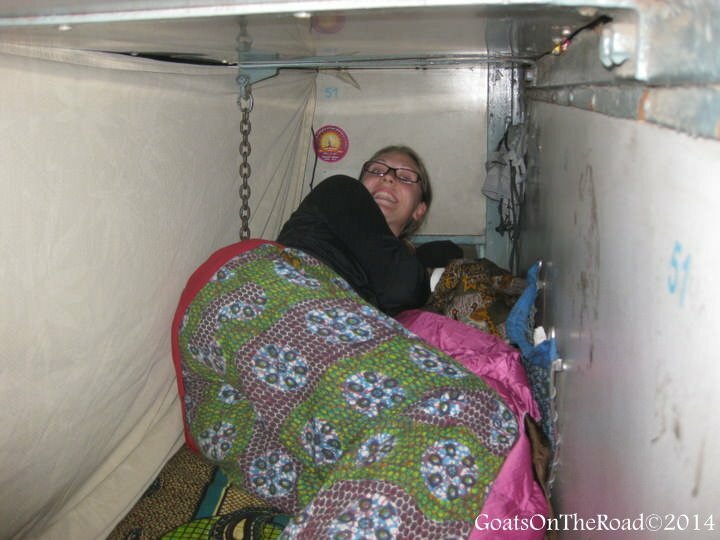 Based on our experiences, here’s a quick list of some of the top 10 things we think every backpacker should know – don’t worry, once you’ve been on the road for a while, all of these things will become second nature! Check out Hostelworld or Booking.com, they’re really good search engines for finding discounted hotels, hostels, guesthouses & apartments. In Southeast Asia, unless it’s high-season or a holiday, you almost never need to book your rooms in advance. Smiling faces will greet you at the pier, bus station or train station waving brochures with pictures and information about their guesthouse. Many times we’ve stayed in these rooms on offer after a long travel journey, and most of them were really great. Also, there’s a plethora of options in Southeast Asia that you really just need to walk around and pick a place that you like. 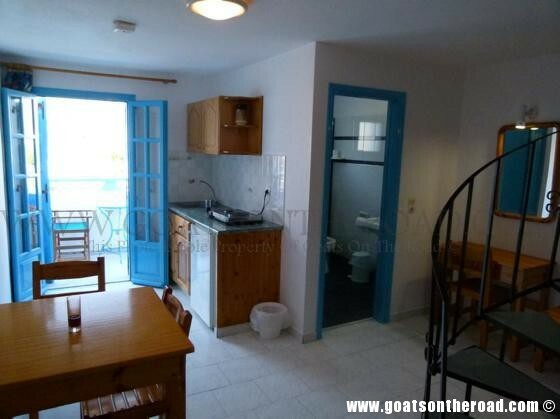 A great apartment we rented at Sandy Villas in Santorini, Greece. Book ahead on Booking.com or Hostelworld for discounts. 2. Always, and we mean always, ask to see a few rooms! 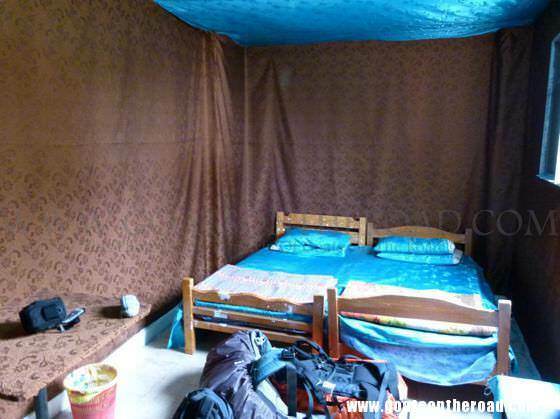 99% of the time the guesthouse owners will show you their worst room first, hoping to pawn it off on you, the unsuspecting backpacker. There’s almost always a better looking room next door to the one their showing you. Look around before committing. This is the kind of room you can end up with if you don’t ask to see a few different ones! This room had fabric glued to everything in the room and it had a sewage pipe under the bed! Since you’ll be travelling throughout the night, you’ve crossed 2 things off of your list: accommodation and transportation. It helps the budget and also, you’ll usually arrive at your destination early in the morning and can get a good start to the day. Travelling during the day is ok because you can see sights along the way, but you end up wasting a day that you could have had at your destination, and spending double the money. Bring ear plugs for those overnight journeys. In most parts of the world, you can bargain for almost anything and everything. In fact, it’s a part of the culture in many regions of the world. Whether it’s a discount on a room, a tour, goods at the market or transportation, always see if you can get the price down (especially in India & Southeast Asia). What’s the worst that can happen? They say ‘no’ and you move on. First of all, many countries (especially the ones in Africa) require you to pay for your visas and certain tours in American Dollars. You may be able to exchange local money to US Dollars, yes, but it’s difficult to get foreign currency in Africa and other parts of the world. Depending on where you’re going or how long your trip will be, we suggest having at minimum about $300 on you. Why you ask? Because you never know if an ATM machine won’t work, will be out of money or will be non-existent. Same thing with credit cards, maybe there aren’t any machines around or the place you’re staying at won’t accept them (which is most likely the case). It’s important to have a combination of currency on you when travelling. We carry a credit card, a debit (ATM) card, local currency and some US Dollars for back-up. You never want to be stuck without money. We suggest having a notebook, an online spreadsheet or an app on your iPhone to keep track of where your money is going…and how quickly you are spending it. For example: if your budget is $50 / day, then write down how much your room costs you for the night and whatever amount is left over is what you have for food, entertainment, transportation and sights/tours. No one wants to end their trip early, so keep track of your money! Check out GoogleDocs for free online spreadsheets and the Trail Wallet App. 7. Always check to see which line is moving the fastest. Whether you’re at immigration or at the airport, have a look at the lines before choosing one to wait in. You don’t want to find yourself stuck behind groups of friends or families who are all checking in at once, that seems to take forever! Look for the solo business travellers with nothing more than a briefcase, and others with carry-on bags. Unfortunately, there was only one line-up in Cuba! The best way to figure out where to go, what to see or where to eat is to talk to others. The locals will almost always know where the best food can be found and where to find off-the-beaten-path gems. Fellow travelers can point you in the direction of a good place to stay and whether or not taking (insert bus company here) is a good idea! You’ll find yourself meeting up with other travelers who have just come from the city or country you’re going to next, pick their brain, get some tips & info for your journey there. 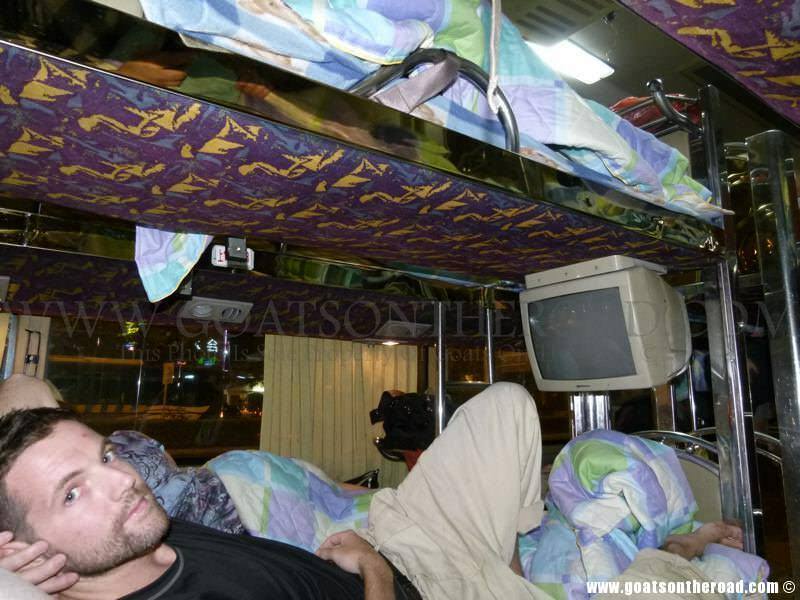 If you have the option, choose your seat with the bus company (we recommend near to the front for views out of the main window) and pick a good berth on the train (ie, not the bottom bunk where everyone congregates during the day on your bed!). If you show up at the bus station the day of your journey, you may find yourself at the very back of the bus (not so good for motion sickness) or worse yet, not making it on the bus at all. Try to book your ticket at least a day in advance. Most likely, you will be separated from your big backpack (it’ll be shoved under the bus, tied down to the roof, etc.) so you will want to make sure you have your passport, money & electronics on you in a separate bag. If you’re on an overnight journey, make sure to have that bag of important items locked and under your head as a pillow or very close to your body. Do not put it above your head on the storage shelf or under your seat; it won’t make for a very happy morning. The tip on carrying some US dollars is so helpful! There have been many times where we’ve been stranded without local currency (banks are closed, ATMs are broken, our cards are frozen) and our stash of dollars has kept us from being hungry. Having US Dollars has come in very handy for us as well – same story, no money in the ATMs (! ), our cards have been frozen and we actually had our card eaten by an ATM as well! Gotta have some american $$. When sleeping on a bus, or in an airport during a layover, I hug and sleep on my bag, wrapping an arm through the straps…. so it won’t grow legs and walk away..
Just wondering how you handled the situation of the ATM eating your card? What did you do to get it back or replaced? Where were you when it happened? In your list… you left out cell phones…… I use a Samsung Rugby II quad band, 3G, GSM phone. Built to military tough specs….. use a ROOTS holster that fits it like a glove and has a better than most belt clip that’s less likely to come off.. And just swap out SIM cards. In Thailand I swapped out my Canadian FIDO SIM and got a True Move SIM card as soon as I got off the plane. Cheap… and you can refill at any 7/11 in Thailand… or at TRUE stores in Thai malls. Hi Rob! Thank you for the comment. So glad to hear you’re out there backpacking at 63 years young! Good for you, very inspiring 🙂 Also, great info about the phone, we do that as well but forgot to mention it. Buying local SIMs are very cheap and topping up the minutes is easy. As for the ATM card fiasco…we had to stay an extra 3 days on the island we were on (which was fine!) before the owner of the ATM machine could come by and open it up and give us our card back. We do travel with two ATM cards though just in case, but we definitely wanted that one back. Cheers and happy travels to you! Don’t forget to ask the locals about the best places to eat. I’ve ended up in some really good & inexpensive pot shops ( huge pots of food on stoves) in Greece and workers’ cafes in Turkey because of talking to the locals! Nice! That’s definitely an excellent tip 🙂 Cheers. We always book at least our first one or two nights at our arrival destination well in advance, especially after coming off a long haul tiring flight. Then just talking with other travelers seems to open up many doors for places to visit and stay that are worthwhile. Great advice! Same here! We love to have our first few night’s booked and then talk to other travellers for suggestions 🙂 Cheers! Hi! I love your blog and your pictures on Instagram 🙂 you helped me so much to plan my backpacking trip to SEA when I’m done with school and stuff! Thanks for that. I still got a question and I hope that you can help me: I wanna go on a 6 months trip with my friends from June or July till December. It’s a long time, I know. But SEA is just so amazing, I’m already counting the days. We want to round from Malaysia to Thailand to Cambodia to Vietnam to China. We want to spend the last weeks on the philippines (probably wrong english, I’m sorry it’s not my first language. I’m german by the way!) But I would love to go to Indonesia first, which would be such a detour, even if we would start in Indonesia it still evolves a lot flying or going by boat. So do you think Indonesia is worth a visit or are the other countries enough? Are they very different? What is your experience? Thanks for eventual help and have fun travelling on! Wow, that sounds like a great trip 🙂 All 7 of the countries that you listed are very different from one another, and they all offer something special. Keep in mind that China is very big! Thailand, Cambodia, Vietnam and Malaysia you could cross the borders by land. The Philippines you would have to fly to, same with Indonesia. Flights with Indigo, Zest, Cebu Pacific or Air Asia are very cheap though, so check those out. I can’t play favourites, but we did love Indonesia and we lived in China for over a year, so I really like it there. Malaysia has a very interesting mix of cultures – therefore there is a wide variety of food, religion, architecture, etc.